Backed by massive industry proficiency, we are involved in presenting to our customers’ world class Overhead Tanks Designing Service. So as to furnish the detailed demands of our patrons, we spend some time with our clients to understand their needs with a motive to accomplish supreme level of client satisfaction. Vayyu Composite Technologies Pvt. 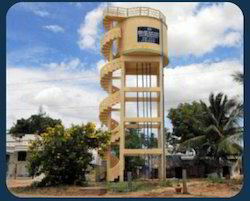 Ltd.
We are offering service for construction, designing, testing and commissioning of overhead water tank. Our personnel work in accordance with the industry recommended guidelines and leave no stone unturned in order to fulfill varied requirements of our clients. We are contractors for designing and contruction of various types of RCC over head tanks. Ever since the incpetion of our organization we have been contruction RCC over heads tanks which also includes TWIN TOWER rc over head tanks. we have completed various projects involving the contruction of RCC over head tanks from inception to implementation. Storage reservoirs and overhead tank are used to store water, liquid petroleum, petroleum products and similar liquids. 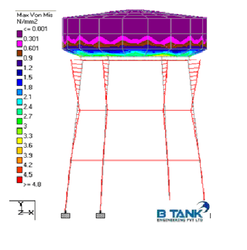 The force analysis of the reservoirs or tanks is about the same irrespective of the chemical nature of the product. All tanks are designed as crack free structures to eliminate any leakage. Owing to the painstaking efforts of our professionals, we have been able to provide excellent Overhead Tank Design Works. The rich industry experience and skills of our experts help us provide the services in the most efficient and cost effective manner. Moreover, the use of advanced technology and machines enable us to customize the services as per the individual requirements of our clients. Mehru Electrical & Mechanical Engineers (P) Ltd.